Crying Beauty, also known as Crying Wolf for all Metal Gear’s fans, is a very unusual creature. She is fast, she is extremely strong but very sensitive at the same time. Together with other members of “The Beauty and the Beast” unit, she can’t help but crying during battles, expressing her deep sorrow in such a way. Crying Wolf turns to Crying Beauty each time a battle ends and gamers get to experience the company of both a beautiful and sensitive female character. A well-known swimsuit model named Mieko Rye gave her facial features to Crying Beauty. Her voice belongs to Debra Wilson Skelton. Starkiller is not the real name of this character. This is just a code-word for Galen Marek’s clone who was created after his death in 2 BBY. His brown eyes and hair, as well as his fair skin, reminded us of Samuel Witwer. Samuel gave Starkiller not only his likeness but his voice as well. Samuel Witwer is a well-known American actor and musician who also appeared in numerous episodes of various TV shows. 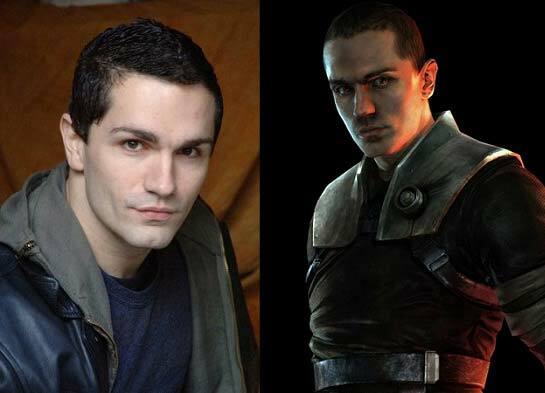 He played Galen Maren and his clone, Starkiller, both in Star Wars: The Force Unleashed and its sequel. The member of Assassin Order, Lucy Stillman, is one face with a famous American actress Kristen Bell. Just take a closer look at Lucy’s face and you won’t be left with any doubt. 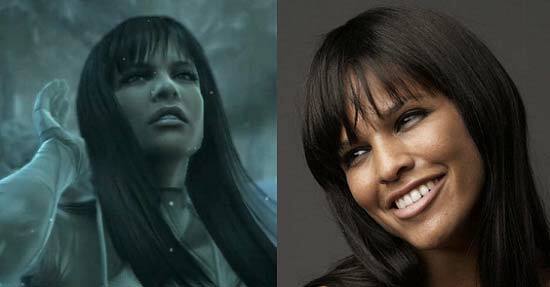 Kristen has given her likeness and voice to Lucy in three Assassin’s Creed games (the years of 2007, 2009 and 2010). The actress herself is known for her roles in “Veronica Mars” (2004-2007) and “When in Rome”. Notably, Assassin’s Creed fans still don’t believe that Lucy Stillman is dead after she was stabbed and killed by Desmond’s Hidden Blade. This clever though a little bit naive Asari scientist has been studying Prothean technology for 50 years. Her mysterious appearance and kind soul becomes the source of Shepard’s romance interest. Depending on players; decisions, Liara may become Shepard’s lover or a good friend, at the very least. 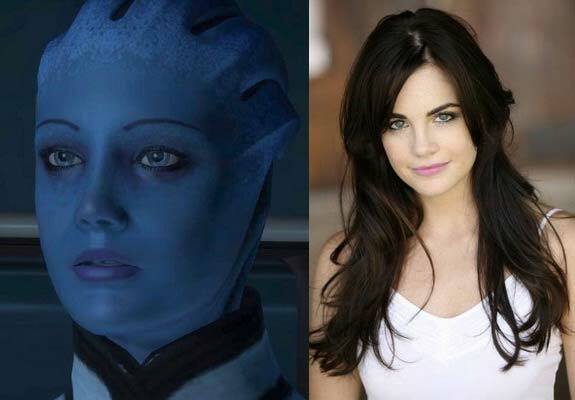 Liara’s body and face are easy to recognize when you take a look at Jillian Murray, a famous American actress. If you don’t know who she is, you better watch “An American Carol”. And finally, here he is. The human protagonist of the “Mass Effect” franchise, Commander Shepard. Actually, his gender, character, and appearance can be chosen by players themselves and all these qualities influence the plot. Shepard can be both a man and a woman. Be it a male character, his voice is no other’s than Mark Vanderloo’s. Mark is a Dutch model and a face of Hugo Boss’ black-and-white billboards. Moreover, he works with other well-known brands like Armani, Calvin Klein, Donna Karan and others. Alex Strike is a copywriter of Writing-Help.com, and a guy very much interested in gaming and innovative technologies. After seeing the resident evil 5, you’ll have to agree with me that Sheva is not a bad character like people say but she is helpful and kind as shown in the game. 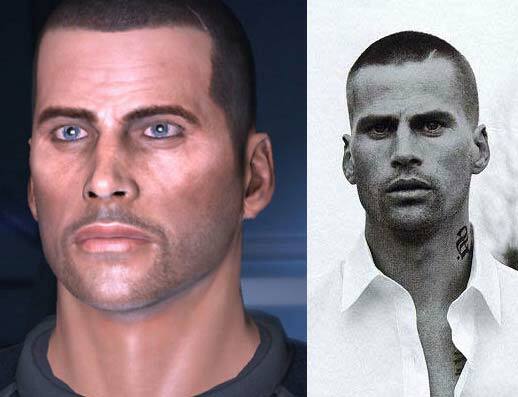 Desmond from assassins creed is also based on a french model. Dude, yo mentioned 3 people from Mass Effect, and then you forgot Yvonne for Miranda? How could you !? Isn’t it already common knowledge that characters look like the real actors? So no Ellen Page from “The Last of Us”? The protagonist character Rio is not only modeled after but also voiced by the talented actress Kristen Miller. There is even an Easter Egg in the game that is triggered by her name! Little known, but vastly enjoyable! What about Takeshi Kaneshiro as Samanosuke Akechi or Jean Reno as Jacques both from Onimusha 3? And what about Julia Voth? She was the Resident Evil´s character Jill Valentine´s model parting from Remake until now. Isn’t Lara Croft from Tomb Raider based on a Model? Megan fox also inspired a look-alike character from “Last of Us”. You forgot Claudia Black as Dragon Age’s Morrigan. She was fantastic in that and Morrigan looks a lot like her.